The short answer to the question was that yes, the Brooks Room is still there, and still packed with stuff. The longer answer was that not only was the room still there, but that the collection had expanded far beyond its original borders. Once I outgrew using the main part of the basement as a play space, The Brooks Room grew to become The Brooks Basement, with the collection taking up every available surface save for the washer and dryer. The hutch in the kitchen upstairs effectively became The Brooks Hutch; it was lined with bobblehead dolls and stacks of cards and tiny models of ballparks. When I moved out, my old bedroom became a sort of Brooks Annex, housing new acquisitions from eBay and older items that he wanted to be more easily accessible. The room was also rechristened with a new store-bought sign that read “This Is Orioles Country,” which was both a symbolic and literal reclaiming of this bit of New York City real estate from me, his Yankees-fan son. Dad’s death was both sudden and not. Walking to the subway with my mom last May after seeing a Broadway show, he had a heart attack, hit his head on the sidewalk, and began bleeding in his brain. He survived but lost much of his brain function, and the weeks that followed were a mix of bad days and slightly less bad days. The end came unexpectedly in July, during one of the slightly less bad periods, on the night of the Home Run Derby. 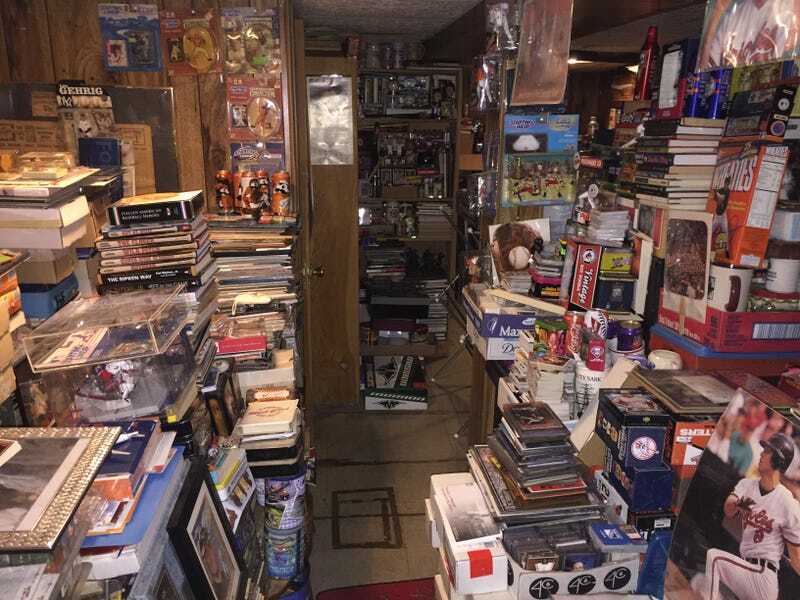 The Brooks Room was what his friends called the small basement room in Queens where he kept his collection of baseball cards, programs, figures, pins, bobblehead dolls, Wheaties boxes, and other assorted sports memorabilia. I’d seen the collection grow and grow throughout my life, and as a result always thought I had a pretty good idea of what was in it. When I was a kid, I’d go with him to card shows around Queens, or visit him at work on days off from school to browse the tables of the card dealers who used to line Broadway in the Financial District—he’d buy Orioles cards or look to fill sets and I’d ask for a buck or two to buy some Patrick Ewing cards for the sticker-covered binder I kept. In later years he’d tell me about his latest eBay purchase, sometimes because he knew I’d find it genuinely neat—this is the right response to an old Orioles scorecard from the 1950s—and sometimes because he knew I’d tease him about it, as when he once bought a tire gauge branded with a logo of a blood-pressure medication because Cal Ripken Jr.’s picture was on the tire gauge’s box. He loved that kind of item, though. My father didn’t collect things because he thought they were valuable, and he didn’t sell things for any reason; he just collected stuff he liked, because he liked having it around. I’d never really dug into the collection myself until the night he died. I knew that something from the collection belonged in his casket with him, and I first went looking for the Orioles cufflinks I’d given him to wear at my wedding. That search didn’t take long — he’d had them on display on his bedroom dresser — but observing the scale of the collection in a new way made clear the task ahead of me. He had always said everything would be mine when he was gone, and now that he was, I knew that I’d need to go through it all—keep the things that meant the most to me, toss the true junk, maybe give a few things away to friends and family, and, over time, sell what was left to start a college fund for my young son. I also knew there was another step: I’d log every last item, because my dad had always wondered exactly how much stuff he had. Even if it took me a couple of decades, I was finally going to find out. The next day didn’t go as smoothly. I’d been convinced by family that those cufflinks had too much sentimental value and that I’d regret not keeping them. 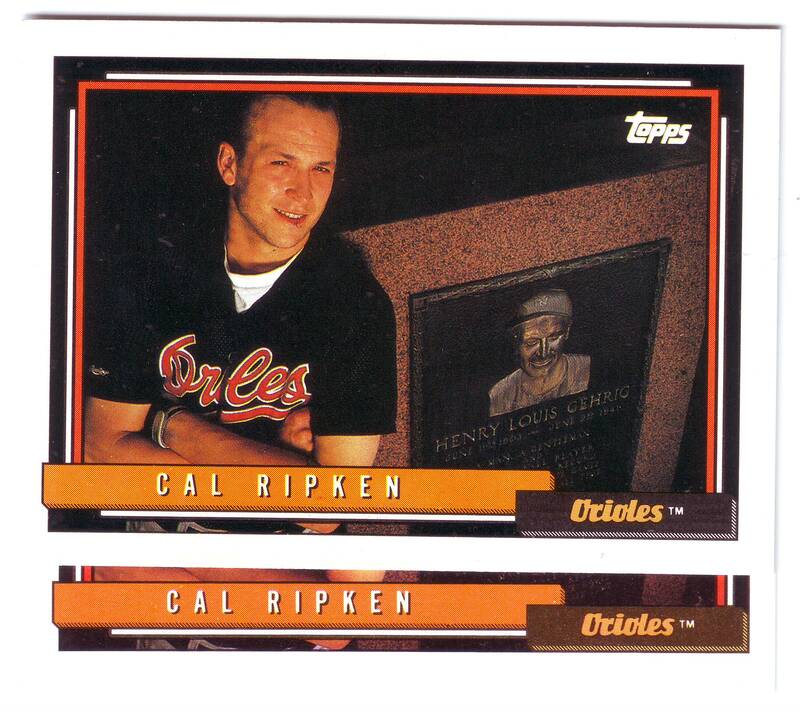 I instead pivoted to Plan B. I’d find his favorite baseball card, and slip it into his jacket pocket at the wake: a 1992 Topps card of Cal Ripken Jr., the one where he’s posing next to Lou Gehrig’s Yankee Stadium monument. That is, if I could find it. There seemed to be little logic to how the collection was organized, at least that I could see. Even if there was, everything was stacked on top of everything else, making it difficult even to reach some places, let alone uncover what might have been buried underneath. Without much of a game plan, I started digging, and found a ‘92 Ripken that someone had pasted into a frame with a swatch of a game-worn Ripken jersey—exactly the sort of thing I could imagine my dad being excited to win on eBay. Panicked I wouldn’t find a better version, I tried removing the card, but couldn’t do it cleanly. And since I couldn’t in good conscience leave him with a single, damaged card, I kept looking. I eventually came across a bunch of items tucked into the crevices of an otherwise stuffed bookshelf. Among them: a ticket from a basketball game at the 1996 Atlanta Olympics, a card autographed by Nolan Ryan, and, thankfully, another ’92 Topps Ripken. This one was in mint condition, facing to the left in its case as was Dad’s preference, despite that being objectively backwards. I’d later realize this wasn’t quite the needle-in-haystack scenario it felt like: I’ve since found 15 more of the same Ripken card scattered throughout the house, plus 11 other versions of the card—one the size of a postage stamp, one made of porcelain, and another made of bronze. By the time I left the house that day, I’d also grabbed a Brooks Robinson rookie card from a binder I’d stumbled upon in my old bedroom. It only seemed right to send him off with cards of his two favorite players. My mom, who over time had resigned herself to living in a shrine to the Baltimore Orioles, selected one of the dozens of O’s caps in the Brooks Room to place in the casket, as well. In hindsight, I’m surprised any of the mourners at the wake even had to ask if the collection was still going strong. This is another part of it. My dad never fully explained how a kid from Brooklyn who never lived a day outside of New York City came to root for the Orioles, but I think I’ve pieced it together over the years. The Dodgers moved west when he was eight years old, and so did the Giants, who were his dad’s team; refusing to root for geographically appropriate teams appears to be something my father inherited from his. Cheering for the hated Yankees was out of the question, and since my dad liked the emerging star Brooks Robinson, he adopted the Orioles as his team and subsequently stuck with them. How big a deal were the Orioles to my dad? By my count, we took 22 summer vacations as a family before he died. We went to Disney World once, visited family friends in Pennsylvania twice, and went to Camden Yards 19 times. On those trips to Baltimore, he’d sometimes bring an empty suitcase just to take home the collectibles he purchased there. I never had the collecting bug nearly as strongly as my dad did, but I found myself powerfully and almost compulsively drawn to my dad’s collection after his death. Every chance I got in the weeks that followed—on weekends, days off, even some mornings before work—I’d look through another new box I’d never noticed before, or browse a stack of magazines I’d never paid much attention to, or open an old tin that I hadn’t realized was packed with odds and ends. There’s a chair in the Brooks Room that I haven’t seen in decades because it has been so thoroughly overtaken by stuff. It could feel like a sort of archaeological dig, with each layer down just a little older than the one above it. At other moments it was more like undoing a game of Tetris, with items of different shapes and sizes strategically if precariously stacked on top of each other. There’s a chair in the Brooks Room that I haven’t seen in decades because it has been so thoroughly overtaken by stuff. In a different section of the basement, busted PA speakers from from my high school band are still preserved under many layers of books and tins and assorted Orioles garden gnomes. The various things that the collection expanded to cover serve to date that stretch of it. The speakers, for instance, have been untouched by human hands since the collection spread over them in the early aughts. Each time I visited, I’d pick a different section of the house to explore. Much of it caused childhood memories to flood back. In one section of the Brooks Room, on a shelf topped with a Baltimore Sun from 1995 and a menu from the long-defunct All-Star Cafe, I found the program from my first-ever hockey game, an Islanders-Penguins tilt in 1990, and remembered how the blaring goal horn scared the hell out of me. I found pages of cards my father and I had gotten signed by old-time Mets at various area Pergament hardware stores some three decades earlier, and remembered how my mom had shuttled us around to get the autographs, since my dad never learned to drive. Other items felt personal in a different way: In a living-room cabinet, I found a 45 of the novelty song “Hockey Sock Rock,” written in 1979 by Alan Thicke and featuring members of the New York Rangers on vocals, a record my father surely bought after I co-wrote a piece about Thicke’s sports fandom several years back. Other discoveries hammered home just how extensive his collection was. I’ve found every Mets yearbook dating back to 1962. Stacked on an old kitchen chair in the basement I found five huge boxes with more than 3,500 Cal Ripken Jr. cards. Virtually all of them are different. The volume and diversity of it all was daunting, especially when I was searching for something specific. I spent weeks looking for a shoebox filled with Topps cards from his childhood, dating back to the late 1950s. When I finally found it, after turning a room upside down, it was surrounded by boxes of far less interesting cards from the ‘80s and ‘90s. Even the junk that padded out the collection and the work before me provided some amusement: A photocopied flyer pushing cards for sale at a Maryland shop circa 1996 touted that people were describing youngster Alex Rodriguez as the next Cal Ripken (fair), and also that Yankee Ruben Rivera was drawing comparisons to Mickey Mantle (oops). The best discoveries were the ones that involved my dad more directly—finds that made hours of browsing through back issues of Beckett and Beijing Olympics Coke cans and empty wax-pack boxes completely worth it. I continued to dig through the collection for months, discovering things and making mental notes of what he kept where, for future reference. I’ve logged just a tiny fraction of the collection so far, but by the end of February, I’d more or less completed a first pass through everything. I’ll sometimes still come across a nook where he’d stored a bunch of hats or collectable pins or whatever else, and I know for sure there’s at least some stuff left to find. I still haven’t come across that tire gauge, for instance. But there probably aren’t any big parts of the collection left to explore. That realization was much more painful than I had anticipated. Even with Dad gone, the collection offered the potential to learn a few last things about him. While there were still things left to uncover, his stuff could tell me the stories he no longer could. Some of those stories I could piece together even if they were scattered throughout the place. In one room, I found postcards from the hotels he stayed at on his high-school track trips to the Penn Relays; in another room, the program from the meet in his senior year was bookmarked to the mile-relay lineups; and in a different part of the house, I found the third-place medal he won in that event. Other times, the stories were more linear and self-contained. I found a letter he typed but may or may not have actually sent to Brooks Robinson; the letter asked for help locating a copy of a book Robinson wrote, and mentioned in passing that it would be nice if Robinson could also send an autograph to his young son, who was a big baseball fan. The letter makes me laugh every time I read it, because it was dated nine years before I, my dad’s first child, was born. I don’t know that I’ll find anything else like that, though. Dad’s been gone for nearly a year now, but in some strange way, finishing that first pass felt a little like losing him all over again. The collection’s still there, though, and I’ll keep looking through it all. I hope that I’ll come across something meaningful I’d missed, or at least something interesting. For so many years, the collection made him so happy. Looking at it that way, exploring it now makes me happy, too. There’s a story in there that I need to hear.